Modify the transients in your tracks by either increasing or reducing their attacks. Bring transient events in the programme forward, or push them to the background, such that the attack of instruments can be accentuated or softened depending on the settings provided. Modify the transients in your tracks by either increasing or reducing their attacks. Sounds simple, though Sonnox's bespoke adaptive process working in the background is anything but. Fortunately the interface keeps things straightforward, with two main controls quickly allowing you to bring â€˜soggyâ€™ drums to life or give more punch to a bass. 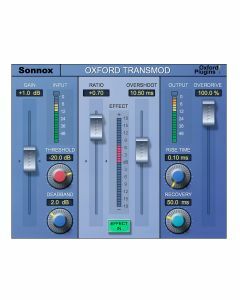 But TransMod is just as relevant to any electronic sound as it is to acoustic ones â€“ pulling transients forward in your mix, or pushing them further back by making the ambience around them more evident. And all this is accomplished without the tonal changes associated with compression. Rather than releasing a vast number of Plug-Ins weâ€™ve instead concentrated on doing a few things really well. Staple, everyday tools that any engineer can reach for with confidence, sure in the knowledge that using each one's intuitive GUI will result in quick, confident and great sounding mix decisions.